I have read and fully understand the terms of the design service. 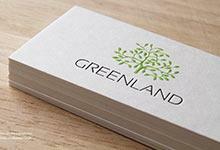 Need more concepts or revisions for your business card or logo design services ? Please purchase our extension services. 2. Our Design Coordinators will gather all of the necessary information, including your budget, ideas and style before forwarding your design preferences onto our Design Department. 3. In order to keep the number of revisions within the project scope, please be as detailed as possible in regards to style. The most effective way to do this is to provide the RockDesign with examples of the styles you like, whenever possible. 4. To avoid the possibility of miscommunication when relaying information to our Design Coordinators, please ensure that all design requests are provided via email prior to any requested phone discussions. 5. With each design revision please be sure to carefully proof read all spelling and numbers. 6. Once the design and print features have been finalized, you will be asked to choose a shipping method. You will then be sent a PayPal payment link for the total remaining cost of your order. Once payment has been received, a pdf proof will be forwarded to you for final approval. Once this proof has been approved via signature, production of your cards will begin. 1. Please provide us with your logo in an editable vector format (ai or eps format). 2. Make sure to correctly select all of the features you want on the card as prices will vary depending on different features. 3. 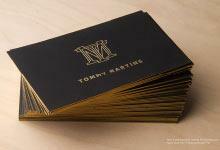 The approximate turnaround time for business card design services is 1-3 business days. 4. If you do not have the logo in vector format, there will be an extra charge for the logo trace. 5. Design fees are not refundable under any circumstances. 6. Please provide us with clear guidance on how you would like the card to look. Any examples demonstrating your preferred style are welcome, as examples provide our designer with a basic understanding of what you are hoping to receive. 7. Our design services are provided to customers who are printing with RockDesign. There will be additional charges for customers printing elsewhere. 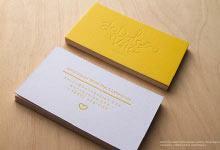 A single design must be selected as the client’s final business card design. Finalized files for the selected business card are available upon the client’s request, ONLY after print products have been purchased or the remaining balance (for clients not printing with RockDesign) has been paid. 8. The client is responsible for ensuring all spelling and numbers are correct on the proof. Even though it may have been correct previously or was provided correctly, errors and glitches happen. Once the the final proof has been approved RockDesign will take no responsibility for any typos or errors. 2. Our designers will gather all of the necessary information (i.e. your budget, ideas and style) before beginning your design. The designs they create will be based on this information. 3. In order to keep the number of revisions within project scope, please be as detailed as possible in regards to style. The most effective way to do this is to provide the designer with examples of the styles you like, whenever possible. 4. Our design coordinators prefer to work with clients via email communication only since this helps reduce miscommunications. All design requests must be provided via email prior to any phone discussions. 5. Once the logo has been agreed upon our designers will begin designing the business cards. 6. With each design revision please be sure to carefully proof read all spelling and numbers. 7. Once the design and print features has been finalized, and a shipping method has been selected, you will be sent a PayPal payment link for the total remaining cost of your order. Once payment has been received, a pdf proof will be forwarded to you for your approval. Once this has been approved, RockDesign will begin production. 1. The approximate turnaround time for logo design services in 1-2 weeks, 3-5 business days for the initial concepts. 2. Design fees are not refundable under any circumstances. 3. Please provide us with clear guidance on how you would like the logo and card to look. Any examples of the style of logo or card you want are welcome, as an example would provide our designer with a basic understanding of what you are hoping to receive. 4. Our design services are provided to customers who are printing with RockDesign. There will be additional charges if a customer orders our design services but printing elsewhere. 5. The client is responsible for ensuring all spelling and numbers are correct on the proof. Even though it may have been correct previously or was provided correctly, errors and glitches happen and things can change. Once the the final proof has been approved RockDesign will take no responsibility for any typos or errors. 6. Design concepts and revisions must be kept within the project scope. Extra concepts or revisions will be additional charges. If you are interested in a combination of multiple design services, please contact [email protected] for further information.